LONG BEACH, Calif. — The interest in alternative fuels is steady, and when customers call wanting, for instance, an electric truck, they want it right now, according to Penske Truck Leasing executives. “It’s a very interesting and exciting time for transportation right now,” Andrew Cullen, senior vice president of fuels and facility services for Penske, told Transport Topics. “It’s very much like several years ago when natural gas was of quite a bit of interest to people in the transportation industry. Now a lot of it is around electrification,” Cullen said. All sorts of alternatively fueled vehicles, from scaled-down ambulances to Class 8 and medium-duty trucks to school buses and passenger cars, were on display here at the Advanced Clean Transportation Expo. It’s a very interesting and exciting time for transportation right now. Penske had people from its logistics group looking at electric yard trucks to potentially fit into its own operation. Also, Penske was interested in the new near-zero natural gas engine from Cummins Inc. The ISX12N engine meets the California Air Resources Board Low nitrogen oxide standard of 0.02 gram per brake horsepower-hour — a 90% reduction from engines operating at current U.S. Environmental Protection Agency NOx limit of 0.2 gram standard. “We have to be able to understand what is going on and articulate this back to our customers and prospects,” Cullen said. Penske’s Dean Stapleton, senior manager of alternative fuels, likened the situation with alternative fuels to a monitoring freight train. “It’s a freight train and its coming and it’s unstoppable. What we are trying to gauge at this point is the speed of that freight train so we can stay ahead of it,” he said. 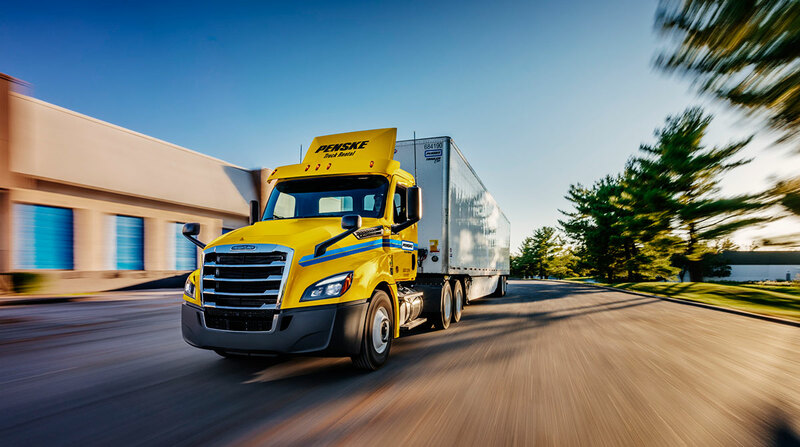 Penske has 270,000 vehicles under management, about 700 are alternative fueled vehicles and half of those are compressed natural gas tractors that it owns. It is also one of the largest buyers of Class 8 trucks in the country. At the same time, it is getting a lot of smaller companies, wineries, smaller delivery companies, that are very interested in an urban electric vehicle, and are looking at looking light- and medium-duty trucks, Classes 3-6, Stapleton said. It’s a freight train and its coming and it’s unstoppable. Plus, Penske is excited about the hydrogen technology, he said. “There are some challenges. It is very expensive to buy. The other part is the availability. If you are in California, it might work for you but if you leave California, at this point, there is insufficient infrastructure to support it. But if you are talking about a long-range vehicle, an over-the-road hauler, there is a real exciting future in hydrogen,” he said. When alternative fuels become more mainstream, fueling or charging infrastructure will have to be there. That is something Penske is looking at potentially supplying to customers. Cullen brought a couple of his best facilities team members along on this trip so they could go out on the floor and talk to people and really strategize, not just for the short term, he said.